University of Chicago Press, 9780226370811, 352pp. In his first year working in Los Angeles’s Skid Row, Forrest Stuart was stopped on the street by police fourteen times. Usually for doing little more than standing there. Juliette, a woman he met during that time, has been stopped by police well over one hundred times, arrested upward of sixty times, and has given up more than a year of her life serving week-long jail sentences. Her most common crime? Simply sitting on the sidewalk—an arrestable offense in LA. Why? What purpose did those arrests serve, for society or for Juliette? How did we reach a point where we’ve cut support for our poorest citizens, yet are spending ever more on policing and prisons? 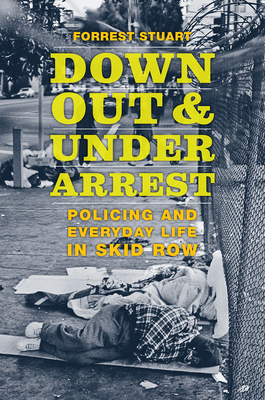 That’s the complicated, maddening story that Stuart tells in Down, Out and Under Arrest, a close-up look at the hows and whys of policing poverty in the contemporary United States. What emerges from Stuart’s years of fieldwork—not only with Skid Row residents, but with the police charged with managing them—is a tragedy built on mistakes and misplaced priorities more than on heroes and villains. He reveals a situation where a lot of people on both sides of this issue are genuinely trying to do the right thing, yet often come up short. Sometimes, in ways that do serious harm. At a time when distrust between police and the residents of disadvantaged neighborhoods has never been higher, Stuart’s book helps us see where we’ve gone wrong, and what steps we could take to begin to change the lives of our poorest citizens—and ultimately our society itself—for the better. Forrest Stuart is assistant professor of sociology at the University of Chicago. "In this exemplary ethnography of a Los Angeles neighborhood, we see the effects of community and institutional framing on the policing of poverty, on social service delivery, and on everyday resistance. . . . Stuart’s book is vital in analyzing the far-reaching effects of neighborhood framing and the policing of poverty. Down, Out, and Under Arrest should be read widely, but especially by those interested in urban neighborhoods, policing, non-profits, poverty, culture, and social movements."